Brad Adams, executive director of the Asia division of Human Rights Watch, said Tuesday in a letter that the English Premier League showed a "shocking lack of interest" in ethical standards for allowing Thaksin Shinawatra's takeover of the Manchester City football club. 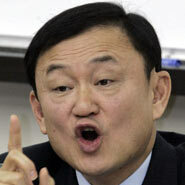 Adams said Thaksin was a horrible human rights abuser. "Our research and that of other credible organizations shows that Thaksin's time in office was characterized by numerous extrajudicial executions, 'disappearances,' illegal abductions, arbitrary detentions, torture and other mistreatment of persons and attacks on media freedoms," Adams said in the letter. His past actions should lead to him being subjected to investigations by impartial police and prosecutors, not welcomed into the club of owners of the most popular football league in the world."